When I read the first volume of Michael Green and Mike Johnson's New 52 Supergirl, I was impressed with the balance the two struck between an edgier Supergirl suitable for modern audiences and still creating a likable character that authentically evokes Supergirl in her many incarnations. Supergirl Vol. 2: Girl in the World toes this line even better, preserving Supergirl's alien-ness while at the same time giving her a darling supporting cast and some human interaction. Plotting here could still use some work, but fans of Sterling Gates's recent stellar run on Supergirl should find themselves comfortable here, too. The first volume of this book mainly involved Supergirl being Supergirl -- fighting government soldiers, fighting Superman, fighting alien conquerors. As such, the dynamic of the book instantly changes when Supergirl meets "Irish punk rocker" Siobhan Smythe, who speaks Kryptonian by dint of magical powers and becomes Supergirl's guide to Earth. This Kara Zor-El doesn't have a secret identity per se, but Siobhan gets her into "people clothes," out to a music club, and eventually on a date. Green and Johnson's use of Siobhan is inspired -- one step removed in that she can't understand most people and most people can't understand her, but she can understand Siobhan, and it humanizes this most alien of Supergirls without lessening her aloofness. Indeed, in the book's fourth chapter, when Kara goofs around with Siobhan and goes on a date with Siobhan's brother Tom -- ending with Kara believing she's a danger to her friends and bidding them a tearful good-bye -- the book really begins to feel like a Supergirl story, like something from Gates or Peter David's runs. The story, a kind of done-in-one bridge between the Siobhan storyline and the next, is even a little bit saccharine-y, as Supergirl stories sometimes are; the stories in the first volume of Supergirl were very action-oriented, so it's auspicious to see the book take on a more emotional, teen romance vibe, if only for a moment. Again, the result is a Supergirl book that's new but also seems familiar. Long-time readers will recognize Siobhan right off as Superman foe Silver Banshee. More kudos to Green and Jonhson for using a familiar character in a new way, rather than creating a new character that might not have as much resonance or staying power. In this new reality, Kara and the Silver Banshee are friends, teamed up against Siobhan's father, the Black Banshee. I like Kara and Siobhan's friendship (and Siobhan's excitement about Kara's powers is contagious, much like Bunker's optimism over in Teen Titans), though I wonder if Green and Johnson aren't just biding their time for a Smallville-esque turn in which Supergirl and Silver Banshee, originally friends, might one day become enemies (again). Green and Johnson present Supergirl's power set as slightly different than Superman's due to her having circled Earth's sun for a while in her rocket ship. I appreciated that this makes Supergirl not just a carbon copy of Superman (and as a matter of fact, the book strongly suggests Supergirl might be the more powerful of the two). We find in the book that Supergirl has an increased ability to channel the energy in her body, creating mild force fields and energy blasts. There's a hint this Supergirl even glows a little bit, and while the association is a bit of a stretch, I couldn't help but hope this was a little nod to the powers of the "Angel Supergirl" over in David's Supergirl series. Series artist Mahmud Asrar offers near flawless art here, often inking his own work and with watercolor-esque colors by Dave McCaig and Paul Mounts. George Perez contributes one issue and it's a treat to see him drawing Supergirl; also Perez draws some genuinely-scary banshee-twisted faces at the end of his issue. While I like Green and Johnson's presentation of Supergirl in general, I think the series still struggles in page-to-page storytelling. 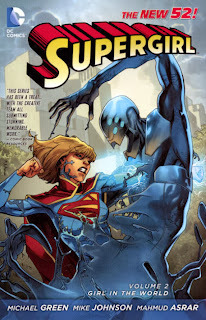 Almost every superhero battle in both volumes of this book have stemmed from some villain coming up and attacking Supergirl; this is not yet a series then lends itself to Supergirl patrolling a city fighting crime, but there's a bit of repetitive structure in Kara minding her own business when suddenly a villain attacks. Moreover the writers can't quite shake the common superhero comics tropes like a fight scene in every issue whether it needs it or not; the sea creatures that just happen to attack Supergirl on the way to her underground fortress are an especially egregious example. I also wasn't crazy about the nuts and bolts of the Black Banshee conflict. There's precedent for this kind of story where a young Superman or Supergirl discovers their vulnerability to magic against a supernatural foe, but I thought the story jumped the shark a bit when Supergirl enters a mystic realm and fights a Black Banshee dragon using swords and armor. I did, however, like that even despite this somewhat esoteric story of magic and ancient curses, the writers tied Siobhan and her brother's own isolation and "stranger in a strange land" aesthetic into Supergirl's own. There's a variety of mysteries inherent in Michael Green and Mike Johnson's Supergirl series, and I liked that with the Zero Month issue that ends this book, they illuminated one (who killed Kara's father) while raising another (what's Superboy doing on ancient Krypton). I know Green and Johnson's time on Supergirl is limited -- just another collection or so -- but I hope they get a chance to answer more of these questions (and pose new ones) before their run ends. If I was on the fence about the New 52 Supergirl before, Supergirl Vol. 2: Girl in the World has assuaged those doubts, and I'd glad to see Supergirl get a good foundation in this new universe. Captain Atom coming up next time. I haven't read a Supergirl comic since Peter David was writing it. Even so I enjoyed reading your post. I'll try to be here for Captain Atom . I hope Supergirl and Siobhan stay friends, I like it when Superheroes got a friend that they can rely on. You'll be pleased to see Siobhan cameos in Supergirl Vol. 3: Sanctuary, and continues to appear, I believe, in the volumes to come.